Vahanvati Machine Tools is a manufactuer of lathe machine, Roll Turning Lathe Machine, exporter of turning lathe, lathe machine parts & lathe machine accessories. We supply to our valuable clients with wide assortment of Roll Turning Lathe Machine, which are extensively used in wide range of industrial applications. 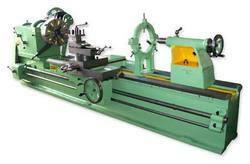 We are engaged in offering superior quality Roll Turning Lathe Machines to the esteemed customers at highly competitive prices. These machines are designed to meet extra heavy jobs with utmost efficiency. In addition to this, the lathe machines are ideal for carrying out surfacing, sliding and screw cutting operations. Being a customer oriented organization; we are deeply engaged in offering a wide array of Heavy Duty Roll Turning Lathe Machine. We offer highly efficient of polygon turning lathe machine which can producing components with better control on dimension and profile. These are used in industries like automobile, machine tools, valves, cylinder manufacturers etc. - Rapid motion 2300 mm/min.